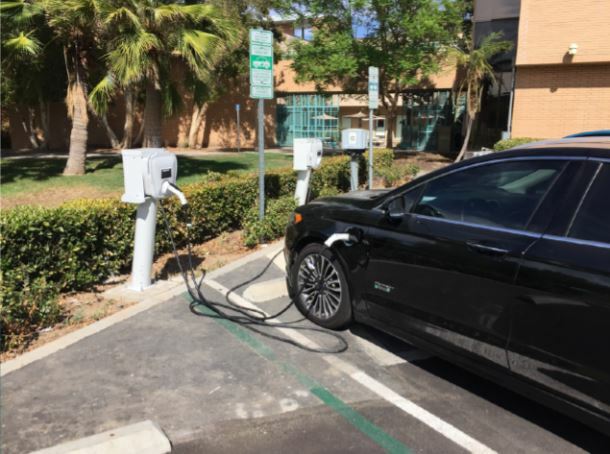 California State University Northridge (CSUN) installed three additional Electric Vehicle (EV) Chargers on campus. The EV Chargers were chosen as a resiliency project because they directly support Zero Emission Vehicles that will help reduce local air quality concerns. By providing the inventive of free EV Charging on campus, CSUN hopes to push more people into these alternatively fueled vehicles and reduce the fossil fuel powered vehicles on the roads. A vehicle charges at one of the three new EV charging stations installed at CSUN. There is currently no fee for using the EV charging stations. The new EV charging units are located in the B5 parking lot as well as the F2 parking lot. These lots are located at different ends of the CSUN campus. The EV Chargers were partially funded through campus sustainability funds, and an external grant for resilience. The project was managed through the Facilities Planning Office at CSUN, and installed by their Physical Plant Management Electric Shop. During the Resilience Assessment, transportation was voted by the campus and community as a priority area for improvement. During CSUN’ s initial resilience assessment, poor air quality was identified as one of the climate change impacts to negatively affect the campus and community. As part of the assessment process CSUN also hosted meetings with neighborhood members, and organized an Open House for students and faculty. 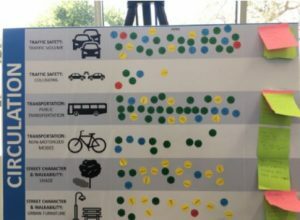 At these events, participants identified transportation as an area of importance to focus on improving. The EV Charging Stations serve as demonstration projects that address air quality concerns, while also improving the transportation infrastructure.